We hooked up with the tech innovator Andy Rigby-Jones to chat Music, Allen & Heath, and find out the news on his new baby the Xone:DB4 that he has fashioned out of aircraft-grade aluminum. EDLX: Where abouts are you at the moment and what have you been upto this weekend? ARJ: Well, currently back in the office after a week off indulging my other passion for motorbikes at the Isle of Man TT. Now just got to catch up on the new design schedules…. EDLX: I have seen you mention you retired from Djing in 2000 what do you miss about the noble art? 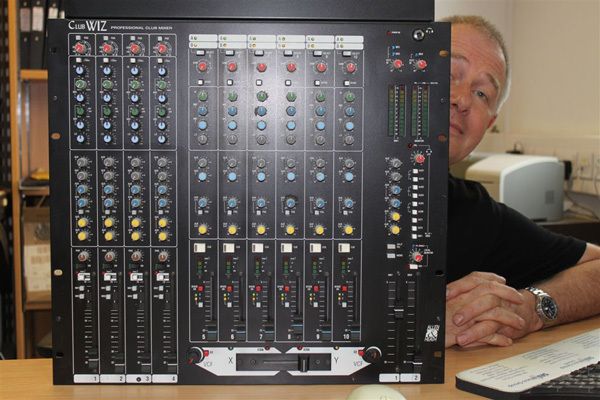 EDLX: For me say the word Allen & Heath and I get a whincing back pain remembering the old analogue 32 channel desk we (including all bands) used to carry into the world renowned Boat Club in Nottingham. Allen & Heaths first foray into DJ equipment was the Clubwiz which later developed into the Xone:62. This was arguably the product that put you on the map for EDM, was it difficult encouraging the company to take a chance on the idea of a portable DJ mixer. I am sure the company as are many djs around the world happy you fought the good fight. ARJ: At the time I was supposed to be working on a VCA control circuit for a Live desk but covertly bread boarded a filter system just to hear what it sounded like; that was what sparked the idea to build a DJ desk, more for my own use than any real thought that it could become a whole new product range. 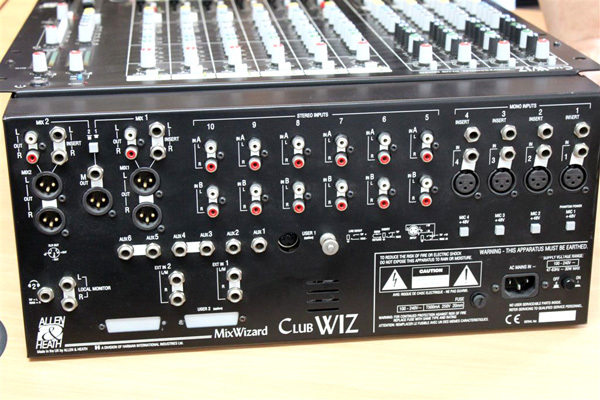 There was some scepticism from management, but our MD Glenn Rogers, having been a mobile DJ himself, decided to humour me, and gave the go-ahead to build a prototype; the fabled “ClubWiz”, which was based on an A&H Mixwizard 20S, (hence the name – the connotations of which we only realised later). We showed ClubWiz at the Frankfurt Music Messe in March 1999 and were really surprised at the level of interest; this was when I was given the go ahead to develop the idea into a proper product, the Xone:464, out of which sprung the Xone:62. EDLX: If you could pick just one track and have one chance to destroy a dancefloor what would your dj weapon of choice be? EDLX: Who surprises you the most when you see them play? ARJ: Josh Wink playing disco at Timewarp. Seriously, I am in awe of all the amazing DJs that we are lucky enough to be involved with. Speedy J and Chris Liebing playing their collabs sets. I really enjoyed Brian Sanhaji’s recent set in Manheim, and Richie Hawtin’s Timewarp set was also awesome. These guys track selection and mixing precision is incredible. EDLX: Past or Present what have been your favourite clubs to frequent. EDLX: What music do you listen to when you are at home? ARJ: In my workshop Chill-out, in the living room classical or Jazz, and in the car Techno. EDLX: Can you give us your electric deluxe label top five tracks? EDLX: For people who are not familiar with you can you tell them in detail what your exact roll at Allen and Heath and what part of the job you find most rewarding? ARJ: I am the design manager for the Xone product range – my main task is to monitor our products place in the market and to keep up to date with new trends or technology that could influence our future designs. I also work on new product concepts and specify the layout and feature set of new products, as well as designing most of the circuitry for the analogue mixers, and layout of the PCBs. The most rewarding part of my job is seeing a design go from an “idea”, to a concept, to a finished product, and then to see it being used in the real World in front of a huge audience…Also meeting so many talented DJs and producers in the line of my work is pretty amazing. EDLX: For people who are not familiar with the DB:4, can you give us a run down of it’s features? ARJ: For me the DB4 is all about the effects – these have been developed from our flagship digital touring desk, the A&H iLive system. Many DJ mixers have effects, but the ones in the DB4 are proper studio quality, and to have not one, but four of these effects engines is unique. The DB4 also has a full matrix input, and until you start using it you don’t realise how it adds another dimension to your mixing – it no longer matters what source is connected to which input, as well as adding the possibility to route one track to all four channels, each with different processing. Then we have the looper per channel, which while not so sophisticated as a DAW looper, is very accessible and easy to use, and thanks to the brilliant work the team did on the BPM detection, it is remarkably accurate. The FX section has five basic types, Delay, Reverb, Resonators, Modulators and Damage (like distortion), but each type has a library of different versions that can be loaded via the menu. Currently the DB4 has about fifty different effects available for each channel, and we will be releasing more soon. The DB4 retains the filters that have become such a feature of the Xones; these are actually a digital emulation of the analogue ones fitted to the Xone:92, but it takes a very good ear to hear the difference. The built-in soundcard makes hooking up to a DAW very easy, as does the extensive MIDI implementation. One nice feature allows you to assign, (via the menu), the upstream USB audio to source from almost anywhere in the signal path; very handy if you are integrating the mixer into your studio for production work, as you use to use it as a four stereo channel, insertable FX processor. One unique feature that the DB4 has is the ability to change EQ modes; a three position switch selects either Isolator mode (total kill), EQ mode, which has a gentler roll off, and only -26dB of cut, or Filter mode. Filter mode is an incredibly powerful mix tool, allowing you to precisely tune the frequency spectrum you feed to the mix, but it does take a bit of practice to get your head around it when if you are used to mixing with EQ only. By the way, the knob pointers change colour to provide visual feedback to which mode you are in. EDLX: What have been the biggest challenges designing the DB:4 throughout the entire process from concept to finished product? ARJ: The hardest part for me was trying to keep the layout of the front panel simple but still provide enough controls to properly explore the power of the DSP effects – I had the easy job… The engineers working on the DSP, BPM detection, and control surface were the ones having sleepless nights! 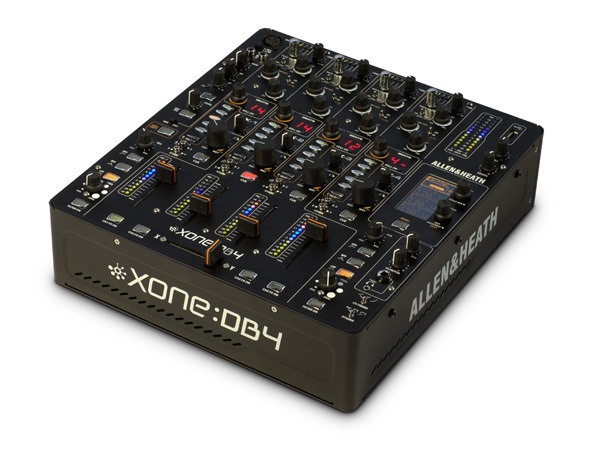 EDLX: While many brands of mixers have had built in FX for years, the DB:4 is the first mixer in the xone range that includes built in FX and loopers. What caused this change, and how do these features relate to the wealth of available external and third party FX and loopers? ARJ: I didn’t want to go down the road of adding FX to our mixers until we had the time, experience and expertise to do it properly. To release a mixer with poor quality FX would have undermined everything we had previously done in building a reputation for professional quality products. EDLX: There are many DJ’s and many genres in dance music, and they each have their specific ways of working so there’s a long list of possible requirements; what are the key factors that make you settle on a specific set of features? ARJ: Trying to keep the basics as simple and intuitive as possible; you wouldn’t want to buy a new car if the brake pedal was on the left, likewise we try to keep to a standard format. This can end up compromising some things, but getting too radical can alienate your market. It’s always a fine line between offering something new, and annoying your customer base by forcing them to do things in a different way. EDLX: How would you describe your personal experience of using the DB:4, what makes it special for you and what are the characteristics that set it apart from other mixers you have used. ARJ: I love using the DB4, not because it is our baby, but because it is so much fun. I have played on it for hours, days, weeks, and every time I start to mix on it I discover something new. This is what makes it special; it has so many different combinations you never get bored with using it. EDLX: Allen & Heath have been making DJ mixers for over a decade now. What are the things you have learned along the way and what ideas and features have stuck since the Club Wiz? EDLX: Compared to earlier models in the xone range, the DB:4 has both lost and gained features; what has been the most difficult trade-off in designing the DB:4? ARJ: Probably an external send/return – there just isn’t the physical space to fit the connectors, not to mention how such a system would integrate with the internal effects. In reality it’s not such a big deal as you get so much on board processing anyway. EDLX: The xone:92 has established it’s self as one of the worlds standard club mixers. It’s a classic, which is up there with the Technics SL1200 and the Roland 909. All have had a profound impact on electronic music. Do you have any personal favorite pieces of gear that you consider classic in terms of engineering, and why? The first time I heard a Mini Moog back in the 70s was a defining moment, so that’s on the list along with the TR808 and TB303. The 808 is a superb piece of analogue engineering, not to mention its brilliant interface. Both the 808 and 303 were derided for not sounding like natural instruments, and at the time you couldn’t give them away; it all adds to the legend. Thirty years later an 808 and 303 still have the power to move a floor…The Mini Moog just looks fantastic and sounds even better. I do have a soft spot for the Xone:V6, but then I’m biased. EDLX: How have the reactions to the DB:4 been so far and are people adopting and using it in the way you had hoped? ARJ: Generally reaction has been great, but it was interesting that a lot of people didn’t really get what it was at first. When we first revealed the mixer there was some negativity regarding the EQ, and some didn’t see the point of FX when you have them in software. It’s only as DJs start to use the mixer that the true power of it becomes apparent, along with the quality of the effects. One DJ that instantly gelled with it was Speedy J when we showed him the prototype, and he was probably the first to use it in anger –other early adoptees were Sasha and Digweed, and of course Dubfire. Deadmau5 has just started using it, which is fantastic. 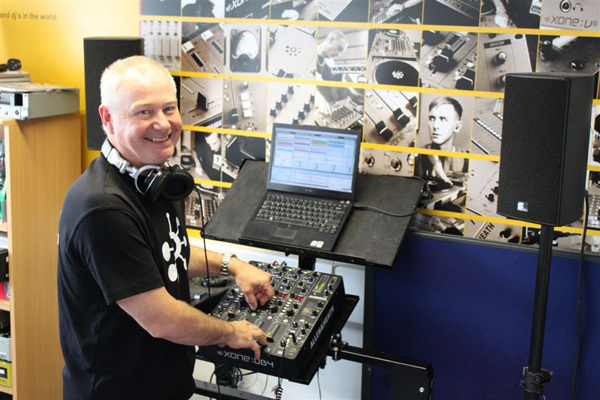 Probably the DJ that is currently wringing the most out of it is Mix Architekt, but as he’s also our Asia Pacific Xone specialist he has an unfair advantage…. As I said earlier, the mixer has so much hidden depth that it takes a lot to learn to use it to the max, so it’s early days as DJs are still discovering what it can bring to their sets. EDLX: Have you seen any use of the DB:4 that blew you away, or has anyone done anything great with it that you never expected? EDLX: As the DB:4 is digital and runs on firmware, what can we expect from it in the future? ARJ: The DB4 is a control surface with a powerful processor and a load of DSP – as it’s fully updateable there is all sorts of stuff we could do in the future..In the short term we will soon be releasing some new effects for it, as well as another installer utility in the menu. EDLX: Can you tell us any information about what your new project might be or is it all top secret? ARJ: Sorry, I am sworn to secrecy; if we were going to release anything new it would have to be at least half as good as the DB4… We could also do with something to stick into the X-Link socket..
EDLX: Thanks for taking the time to tell us about the db4 and giving our readers an insight into the man behind the machine.